Why Act Out a Story? This is a great way to see if the story you have just read has been understood. 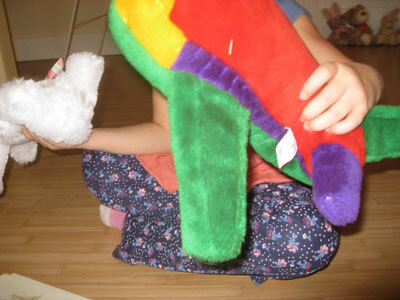 You get to assess reading comprehension, vocabulary knowledge and sequencing skills while the ‘actor’ gets to have fun! 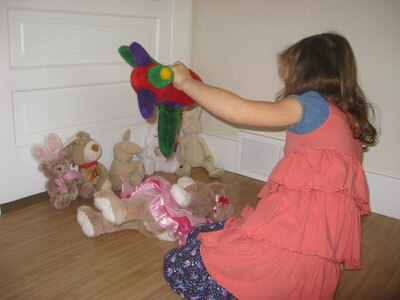 This activity gives the actor opportunity, to make a personal connection with the story. We read the story together. 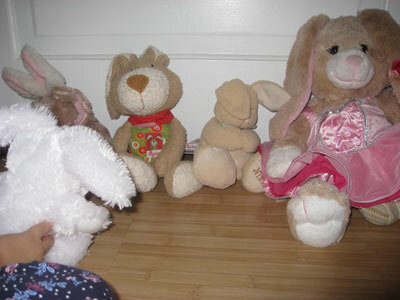 Then we gathered the main characters; mainly rabbits in this story- yes we have too many stuffed rabbits! The only props we needed were a tree and a remote control. The clothes horse stood in for a tree and my camera case was a remote. Lettuce lived high on a hill. Nibble, nibble, hop, hop, everyday was the same. A small bird flew by. “I wish I could fly.” said Lettuce. 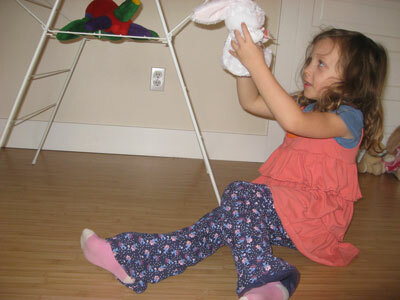 She tried jumping and flapping her arms and ears. “I’ll never be able to fly”. 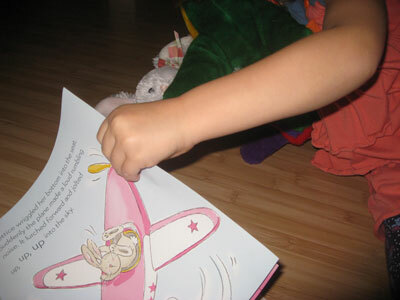 She heard a hum and saw a beautiful pink aeroplane. It landed and Lettuce jumped inside. It took off and went up, up, up into the sky. “Help” Lettuce sqealed and then “I never knew the world was this big!”. Judder, lank, CRASH. The plan landed in a tree. Lettuce held onto a branch of the tree. She fell down, down, down into the arms of a little girl. I just wanted to fly and now I’ll never get home” moaned Lettuce. 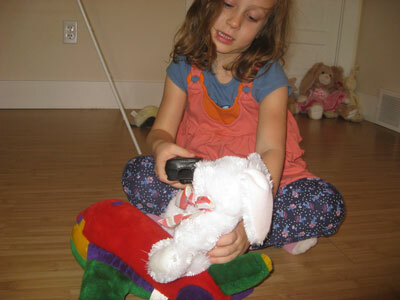 “I’ll fly you back” and she showed Lettuce the remote control. She flew back home and all the bunnies were excited to see her. When she landed and went to the burrow she told all the bunnies about her trip. The book we read is “Lettuce The Flying Rabbit” by Mandy Stanley. 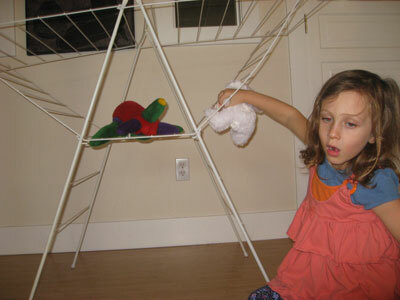 She enjoyed the acting and role-played again as I reread the story. 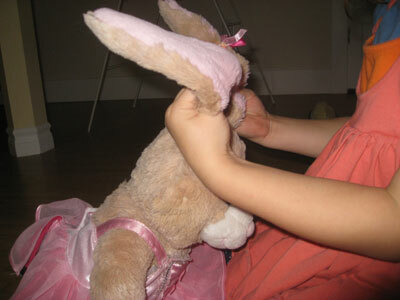 In these photos you may see a girl playing with stuffies or you may see a wonderful story about a flying rabbit. This activity can be done in many different ways. You can vary the props, characters, method of roll playing, scenery. The options are endless. How have you acted out a story?